At times there are important worship events such as weddings and funerals that involve or effect your members. You–as the leader of your ministry within the mentally challenged community–may not be asked to participate in the occasion. Another pastor from across town who barely knows the member could be charged with the task of officiating at the worship service. Yes, this has happened repeatedly to the pastoral staff at Special Gathering. This oversight strikes us, bringing us back to the reality of how we, as ministers, may be perceived within the church world. This slight never seems to lose its sting. First, let me say most parents and churches value our place in the lives of our members. Yet, when tragedy, such as a death occurs, the minister within the special needs community may be the last person to be considered to conduct or even participate at the funeral. After a funeral service for one of our extremely faithful members, one agency person explained to me, “The family delegated to us the responsibility of arranging the funeral. We didn’t know what we were doing. There was only one pastor we knew. He had been on our agency staff about 10 years ago. He knew Charles and that seemed to be a natural connection,” she shrugged, frowned and walked away. No one from Special Gathering had been asked to participate. The people who participated were members of a church where he had never attended. Other than the pastor, the participants were people he had never met. Understand, after the funeral and once the oversight was realized, there were no apologies given. A few people said, “Oh, well,” as an explanation. So we weren’t asked, what will be our response? Our commitment and our loyalty THE COMMUNITY we serve will not change. Our ministry is within the mentally challenged community. I cry when I need to. However, when I cry I try to let it be with people who aren’t grieving or by myself. Getting angry is not a sin. But long-lasting anger leads to bitterness which is a sin. As quickly as possible, get over the hurt and don’t let resentment begin to reside in your spirit. Make home visits to your members who were friends of the person who died. Short “I love you” visits are always welcomed and appreciated. If people aren’t home, leave a note. These short expressions of love will be cherished. I know, I’ve received a few of them. If possible, visit the family and allow them to vent and express their grief. Remember to include the professional community in our grief visits. They are also hurting. In short, God hasn’t called us to a ministry that is wonderfully complicated. The rewards are many. The slights are many. However, the rewards do massively outweigh the slights. We can rejoice in the calling of God in our lives. He is a good God. When I gave the devotions, he sat on the front row and repeated me–loudly. This was a behavior that he could control. Therefore, I would remind him week by week that if he repeated me, he would have to sit further back next week. After, the chapel service, he would come up to me. “How did I do?” he would ask while giving me a hug. Standing in your personal space, he demanded that you give him all of your attention. There are few people who can irritate the tar out of people; yet command the kind of love that you felt for him. He made you laugh at yourself because you knew that Charlie wasn’t taking you or your aggravation seriously. He picked and teased and frustrated the residents and staff who lived in the home where he lived. He was often moved from home to home because residents and staff could only take his shenanigans for so long. His girlfriend was Amy and he showered her with compliments and ardent expressions of admiration. She ignored or rebuffed his attentions. When he moved his attentions to Gale, she returned his love with the same irritated neglect. But Charlie was unmoved with her lack of ardor. Charlie won my heart because of his faithfulness to our chapel program every Saturday for the past ten years. During Bible study time, he knew all the answers to the questions. But he was gracious enough to allow others to give the answer. He would never blurt out the answers. He wanted to grow in his love for Jesus; and he wasn’t ashamed to tell others about his love for the Lord. 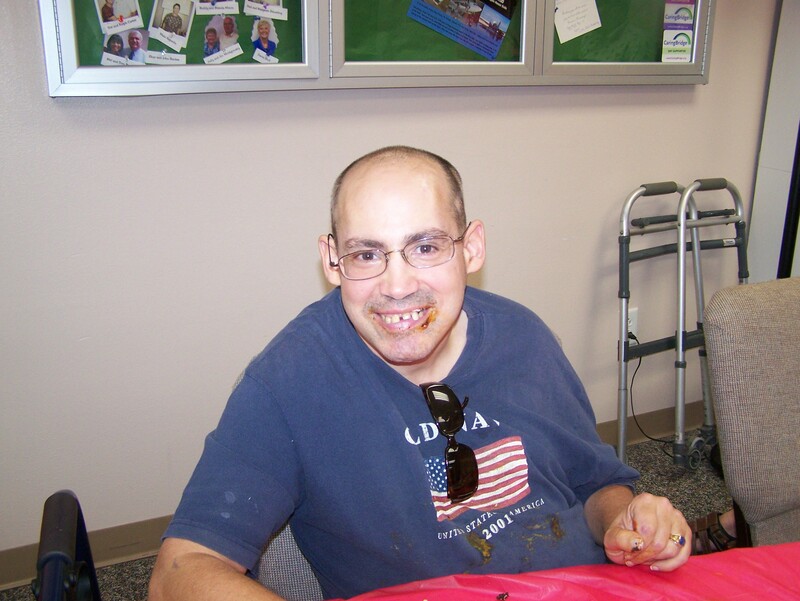 In every group home where he lived, he insisted that there was prayer before the meals. Last Saturday’s chapel program was an unusual day. A member’s grandfather had died on Tuesday. Phil, the grandfather, had been active within the mentally challenged community for more than 20 years. We had a short informal memorial time for Phil as part of the Bible study. During the chapel program, Charlie had not sat in the front row because his staff had seated him toward the middle. Someone else had gotten his walker and helped him from the chapel into the other room. When he left the building to load the van, heading home, I gave him a short good-bye. But unlike most week, I had no other interaction with him. Less than 12 hours later, Charlie died. The medical professionals say that he had a heart attack. This 33-year-0ld man slipped quietly into the arms of his Savior. For the only time in years, Charlie had not demanded my attention during the chapel program. Therefore, I didn’t get to tell Charlie good-bye or get one last sloppy hug. I don’t feel guilt. I do feel grief and sorrow. Life is fragile. Within the mentally challenged community, life is tenuous. Young men and women with no known medical conditions can have serious and life-threatening ailments waiting to snap them away from life. Today, the mentally challenged community is grieving and so am I. Central Theme: God wants us to understand that we can pray at all time. Introduction–Turn on the radio. Explain that the radio receives messages from the air. Those messages are out there all the time. But you can’t hear the messages if you don’t turn on the radio. Prayer is somewhat like that. God is there waiting to listen to us all the time but we must pray for him to hear from us. Have a member read I Thessalonians 5:17. I. Tell the story of Elijah and Mount Carmel. A. Elijah prayed to the Lord and God answered. B. We can understand that God is always there for us. C. Prayer speaks to the Lord. 1. We don’t have to wait for him to come out of the bathroom or wake up from a nap. II. Prayer is the most effective and powerful tool we have. A. Derek Prince told about praying in WWII and how it won the war. C. Our prayers don‘t go to the ceiling; God hears them. III. Prayer can be hard work but it can also be joyful. 1. I have asked in the past that to get into the habit of prayer, you should pray 10 times a day. 2. I say that because when I was a young woman my teacher challenged me. A. It changed my life as I prayed short prayers. It kept my heart and mind on the Lord all during the day. 3. God is so pleased when you pray to him. Conclusions: We are to pray at all time. God will hear you and he will answer you. Interesting article regarding the Senate’s passage of a Medicaide Extension Bill. It’s found on Fierce Health Care.com . Steve Rossi of Rossi’s Total Lawn Care just came by to give me an estimate to remove the branches of my Java Plum Tree that have the majority of the seasonal fruit on them. As I’ve talked about before, this is a beautiful tree that was well-placed in the middle of my front yard, until we added on to the house. Now it is positioned too close to the driveway. During the month of August, an abundant amount of the fruit drops each hour on our drive. The plum is an interesting fruit that is known in Eastern tropical countries as beneficial for treating eye problems, diabetes and dehydration. However, it is known as an invasive tree in Florida. It grows mostly in South Florida because it doesn’t adapt well in Central Florida. When I purchased it almost 30 years ago, it was not on the invasive tree list. Often, Christians are like my plum tree. We would be great planted properly; but we seem to cause lots of trouble when we aren’t placed correctly in the Lord’s vineyard. Sometimes we simply have not found our place in the body. This year Special Gathering is embarking on an ambitious endeavor of helping develop an internship program. We desire to enable young and older men and women to find their place in the body of Christ. Camp Daniel in Wisconsin is also desiring to train men and women who feel a call of God in their lives. I know from some past bitter experiences that trying to produce fruit in a place where you don’t belong can be devastating. The Java plum tree is beautiful when well placed. It is beneficial and even has healing properties when its fruit is valued and used. Pray for the men and women who are being called to special needs ministries that God will lead them to the fields where they can be used for His kingdom and His glory. Up to this point, our luncheon discussion had been that the church-at-large does not always know how to effectively disciple people with disabilities. Either church members ignore misbehavior or they ask the misbehaving person to leave the church. I had said that the church is not indifferent to the spiritual needs of the mentally challenged community. They simply do not know how to handle behaviors. After about 15 minutes of discussion, she asked me about the two women who were kissing during the worship services. Once again it appears to me, the two women with disabilities are being ignored by a person in a leadership position until she reports them to the senior pastor. Our executive director sometimes says, “Just because a person has a disability, it doesn’t mean he or she isn’t a jerk.” In other words, people with disabilities aren’t naturally born, super-spiritual saints. They are people in need of redemption and consistent discipleship. Rather than being dismissive by ignoring or asking people to leave, mentally challenged people deserve the dignity of being treated like other church members.